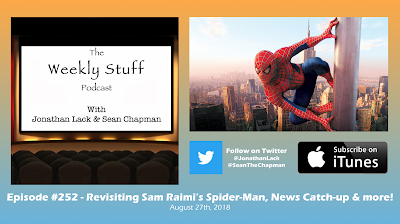 The Weekly Stuff Podcast #252 – Revisiting Sam Raimi’s Spider-Man, News Catch-Up, and more! With Insomniac’s highly-anticipated Spider-Man game swinging onto the PS4 next month, we thought now would be the perfect time to revisit some of our favorite superhero films of all time: Sam Raimi’s Spider-Man trilogy from the early 2000s, starting this week with the original Spider-Man from 2002. In many ways, this film is the template for the superhero boom we’re living in right now, so thoroughly did Raimi embrace the character’s comic-book origins, but the film is also a product of a different time, and while it’s become fashionable to dismiss Raimi’s films as ‘outdated,’ we would argue that the first two, at least, deserve serious consideration amongst any discussion of the best films the genre has to offer. 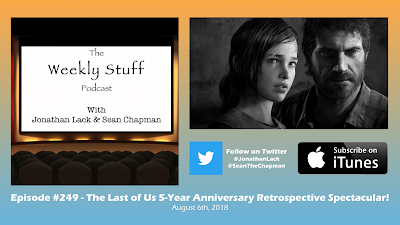 It’s a great, in-depth conversation on a film worthy of reconsideration, and before that, we also catch-up on a month’s worth of news, Jonathan’s recent move to Iowa and first encounter with Shenmue, Sean’s continuing Monster Hunter adventures, and more. 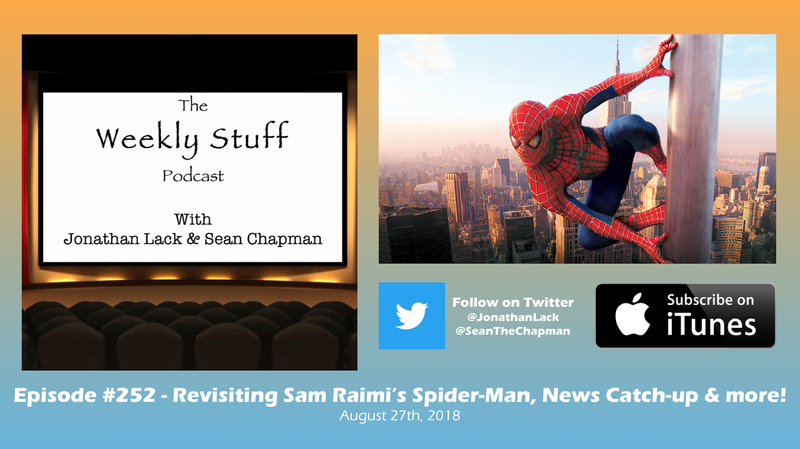 It’s time for the special 251stepisode of The Weekly Stuff Podcast with Jonathan Lack & Sean Chapman, a weekly audio show that explores the worlds of film, television, and video games. You can subscribe for free in iTunes by following this link. Last week, on our special 250thpodcast, we began counting down our Top 10 Favorite Games of All Time. We did this once before, way back in 2013, but with 5 years and the better part of an entire console generation having passed, we thought now would be a great time to revisit this topics and remake our personal video game canons. We covered #10 through #6 on each of our lists last week, and this week, we finish the countdown with #5 through #1. It’s a great conversation, filled with more than a few surprises, as we talk about our very favorite games of all time. Thanks for listening to 250 episodes of The Weekly Stuff Podcast, and we hope you enjoy! It’s time for the special 250th episode of The Weekly Stuff Podcast with Jonathan Lack & Sean Chapman, a weekly audio show that explores the worlds of film, television, and video games. You can subscribe for free in iTunes by following this link. 250 is a big number. It’s a lot of episodes. It represents somewhere in the vicinity of 750 hours of podcast recording, better known as one full month’s worth of time. 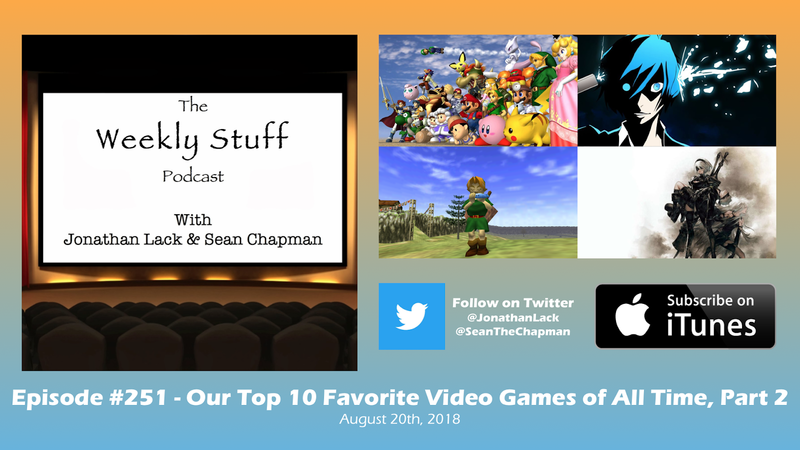 And for the occasion, we are revisiting one of our oldest topics: Our Top 10 Favorite Games of All Time. We originally did this topic for episodes 55, 56, and 57 of the podcast, back in 2013, before the launch of the PS4 and one of the most rewarding periods in video game history. Five years later, Sean and Jonathan have completely remade their lists, keeping some favorites, throwing others away, and welcoming in a lot of newcomers, old and new. 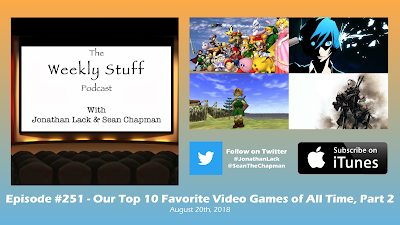 We’re splitting this discussion into two parts, with this week’s episode covering the bottom half of our lists – #10 through #6 – while next week’s show will cover #5 through #1. 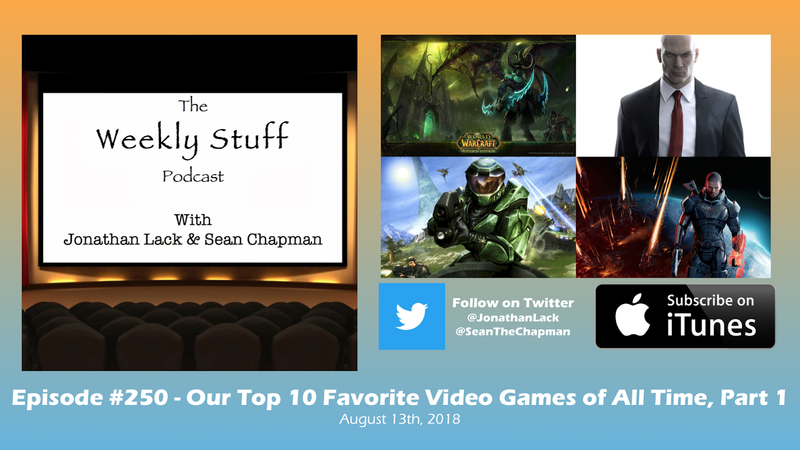 These were fun, challenging lists to put together, and made for one of our most engaging discussions ever, as we talk through the games that best encapsulate our personal canons. Enjoy, and come back next week for Part 2!